Samuel "Sammy" Jackson Stroud, Jr. Celebrating the life of Samuel "Sammy" Jackson Stroud, Jr.
Be the first to share your favorite memory, photo or story of Samuel "Sammy". This memorial page is dedicated for family, friends and future generations to celebrate the life of their loved one. Obituary for Samuel "Sammy" Jackson Stroud, Jr.
DURHAM: Samuel Jackson “Sammy” Stroud, Jr. 58, passed away on Saturday, March 30, 2019 at his home in Durham. He was born in Lenoir County, NC to the late Samuel Jackson Stroud, Sr. and the surviving Shirley Stroud. Sammy was a skilled woodworker and inventor. 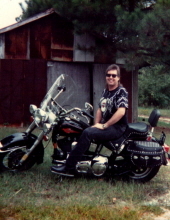 He loved to ride his Harley Davidson. Sammy had a passion for rock music and reading, especially philosophy and mysteries. In addition to his mother, Sammy is survived by his wife, Karen Stroud; son, Andrew Jackson “A.J.” Stroud; daughter, Haley Renee Stroud; grandchildren, Landon Russett, Silas Powell; sisters, Danielle Piner, Lydia Stroud. The family will receive friends from 6 to 8 p.m. on Tuesday, April 2nd at Clements Funeral Home in Durham. A funeral service will be held at 2 p.m. on Wednesday, April 3rd at Alum Springs Baptist Church in Mt. Olive, NC with Pastor Ashley Summerlin officiating. Burial will follow at Herring Family Cemetery in Mt. Olive. In lieu of flowers, the family request that memorial donations be made to Guide Dogs for the Blind: P.O. Box 151200 San Rafael, CA 94915. To send flowers or a remembrance gift to the family of Samuel "Sammy" Jackson Stroud, Jr., please visit our Tribute Store. "Email Address" would like to share the life celebration of Samuel "Sammy" Jackson Stroud, Jr.. Click on the "link" to go to share a favorite memory or leave a condolence message for the family.